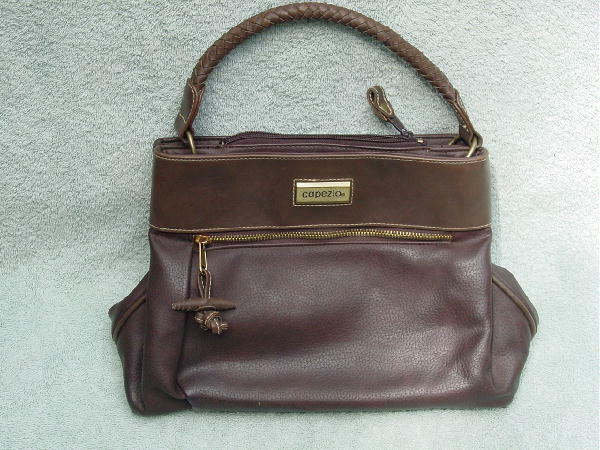 This vintage Capezio faux leather purse is in a brown color with a touch of taupe. There are 3 separate sections. The center has a top side to side zipper and the front and back sections are open and each has a snap closure. The 13" handle has a braided faux leather covering attached to the body of the purse by metal rings. The front has a zippered compartment with a rolled faux leather pull. It has a light brown fabric lining with Capezio printed all over it.